I’m a bit of a gadfly in the Banyan Hill newsroom. Naturally, most of us are laser-focused on stock prices and the health of the market. I spend a lot of my time on that, too … but I’m also a “big picture” guy. And that often makes me a contrarian. For example, we often talk about stock picks. I’ll sometimes point out that although the company in question may be a short-term winner, it’s contributing to a negative long-term economic trend … like the dramatic rise in wealth inequality. I don’t blame my colleagues when they reply: “That’s as may be, but I’ll take the profits, thank you very much.” That’s their job. But I must raise these issues anyway. That’s because thousands of subscribers to my Bauman Letter tell me they want to protect wealth as well as generate it. And to protect wealth, you keep an eye on where the world is going … not just next week or next quarter, but over the long haul. Western-style capitalism is in grave danger. Most people don’t know why … or how dangerous the outcome could be. Since 1997 market concentration has risen in two-thirds of American industries. A tenth of the economy is made up of industries in which four firms control more than two-thirds of the market. In a healthy economy you would expect profits to be competed down, but the free cashflow of companies is 76% above its 50-year average, relative to GDP… We calculate the global pool of abnormal profits to be $660 billion, more than two-thirds of which is made in America, one-third of that in technology firms. The report goes on to identify industries where unjustified “economic rents” are being made. Two of the biggest sources of these rents — the technical term for extra profits from market power — are Google and Facebook. They’re free for us. But they control so much of the world’s advertising market that they can force other firms to pay high marketing prices … who then pass them on to us. And new-economy firms aren’t the only ones enjoying “hidden” economic rents like these. In credit cards, pharmaceuticals and credit scoring, so few companies dominate the market that they can set their own prices without fear of competition. That kind of economic rent is often hard to see unless you look for it. But there are more obvious forms as well. America’s airlines are expensive and provide poor service. American cable networks have raised prices at more than double the rate of inflation over the last decade. American broadband costs are among the highest in the world for the speeds we get. The expectation of future economic rents even drives the stock market. The high prices of Netflix and Amazon shares assume they will someday be able to charge excessive prices because they won’t have many competitors. Market concentration also helps to explain several other features of the modern capitalist economy. 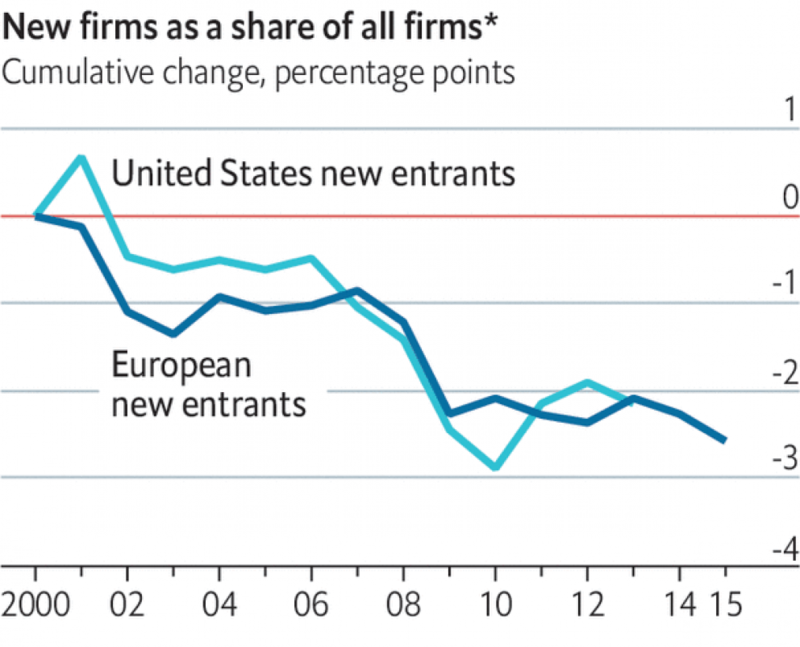 For example, despite low interest rates, most U.S. and European firms invest only a tiny part of their profits. Why bother? They don’t need to worry about competition from newcomers. The rate of innovation has fallen steeply for the same reason. Second, since 2000 the share of gross domestic product (GDP) going to workers employed in highly concentrated industries has fallen faster than in the rest of the economy. A big firm with no competitors can give new employees a “take it or leave it” offer. That’s a reason why decreasing unemployment hasn’t been matched by rising real wages. Third, new company formation is at an all-time low and dropping rapidly. The Economist is a conservative publication. It’s so conservative that it recommends an old-fashioned solution to this problem … government intervention. Control over personal information should reside in individual customers, not in tech companies. Companies that acquire large amounts of customer data should be required to license it to rivals. Patents should be harder to get and keep, and shorter. Second, artificial barriers to the entry of new firms must go. These include non-compete clauses — incredibly, imposed these days even on fast-food workers — occupational licensing requirements and complex regulations written by industry lobbyists. This is a serious problem: Over 20% of American workers must hold licenses to do their jobs, compared to just 5% in 1950. Third, antitrust laws must be enforced. Regulators need “to pay more attention to the overall competitive health of markets and to returns on capital,” which are historically excessive. As I say, intervention of this type is essentially conservative. That’s because it is aimed at restoring competition to Western capitalism. Competition is what made capitalism a success story … and is the only thing that justifies it. Without competition, capitalism is simply a big racket, with us as the marks. As the editors of The Economist know, government rules designed to increase competition were essential to producing the world we know today. Those have been replaced by new rules written by the racketeers themselves. It’s time to join the call: Aux Barricades Mes Enfants! Next »Will China Come to a Trade Agreement?